Most people hate conflict. For some, like my husband Bernard, avoiding conflict is their way of “resolving” it. Unfortunately, that doesn’t always work. 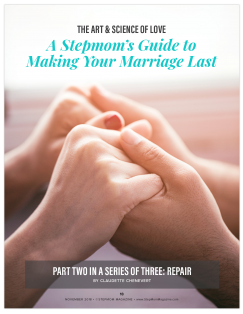 In last month’s edition of StepMom, I shared with you the importance of practicing Maintenance first—making it easier to bounce back from conflict after an argument. I offered tips for getting in a Maintenance Mindset and shared a plan for logging the six hours needed weekly to maintain (Editor’s Note: see Oct. 2018 Back Issue). Maintenance also contributes to what we’ll talk about this month: Repair. During our two-day participation in “The Art and Science of Love” workshop at The Gottman Institute, Bernard and I learned that: Without maintenance? Repair is difficult to achieve, if not impossible. Since then we’ve become increasingly mindful of how we spend our time together and which parts of our maintenance plan require extra focus. Was that true for you and your partner, too? Surprised by the gaps we found, in our existing maintenance and repair strategies, we’ve begun to actively incorporate new ones into our own daily and weekly routines. I want you to be able to do the same in your relationship, as you begin to deal with conflict head-on and learn the art of repair. Before digging into this installment, refer to the “Got Conflict?” sidebar for a refresher on what distinguishes Masters, who turn toward one another, from Disasters, who turn away. What’s your conflict type? Research by John L. Gottman, PhD, shows that – when it comes to conflict—there are five basic types of couples: Conflict-Avoiding, Validating, Volatile, Hostile and Hostile- Detached. The first three emerged from “Communication, Conflict and Marriage” by Harold L. Raush, PhD. The Gottman Institute refers to those as “happy couple types.” The last two were coined in The Gottman Institute’s Love Lab. Read each of their descriptions with your partner. Which one most closely matches your own? …To read the rest of this article, log in and download the November 2018 issue. Don’t have an account? Click here to subscribe.